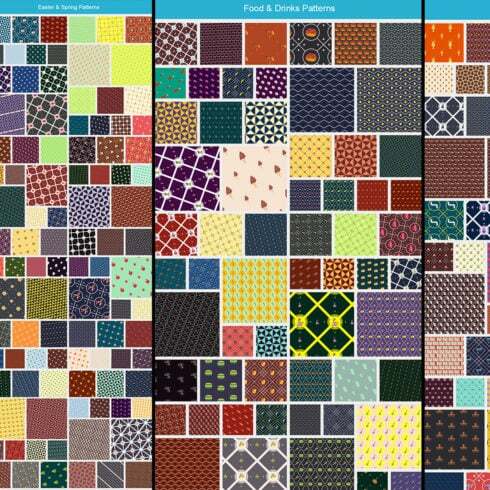 Finding best patterns isn’t easy, especially if you’re looking for a bundle to suit every designer need and purpose. With a set of unique ready-made patterns, you can make any project pop, whether it’s business or personal. Delivered to you by professional designers, these patterns will save your precious time. Interested to learn more? What Are the Advantages of Best Patterns? It’s no secret, designers may use a lot of pre-made elements in their work. So, pre-made patterns can come in handy at the time of need. Floral, animal, and festive ornaments, geometric elements and whatnot will help you create stunning designs from greeting cards to personal blog backgrounds. Drawing a set of versatile patterns from scratch is a time-consuming task even for the most experienced designer. Purchasing the bundle will make your further work headache-free. So, what are the advantages of the best patterns by MasterBundles? 100% customizable vector designs, no quality loss. Most importantly, investing in these designs, you invest in your future work. Best patterns bundle is completely recyclable, so it will never be out of date. Don’t hesitate, while the discounts are still hot. Order the best patterns from MasterBundles and create eye-catching designs in no time! Every designer knows that patterns are one of the fastest and easiest ways to give your work a touch of originality and personality. And that’s why they’re a real saver, especially in times of need. They’re extremely versatile and can be used in a large variety of designs, but in the same time they’re incredibly difficult to draw from scratch. It’s a time-consuming activity, and the one thing we lack most is time. 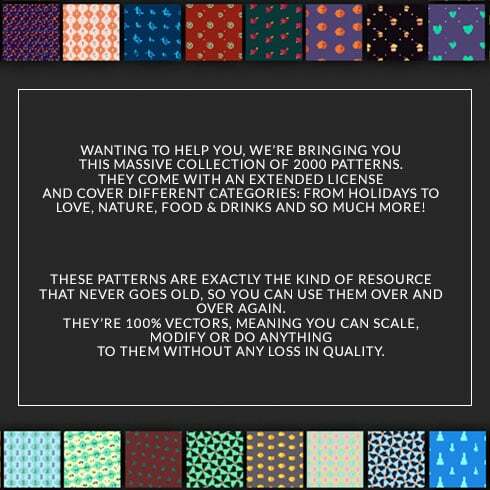 Wanting to help you, we’re bringing you this massive collection of 2000 patterns. They come with an extended license and cover different categories: from holidays to love, nature, food & drinks and so much more! These patterns are exactly the kind of resource that never goes old, so you can use them over and over again. They’re 100% vectors, meaning you can scale, modify or do anything to them without any loss in quality. And the great news is that now you can grab this mega bundle for only $32 – that’s a huge 99% off the regular price! Essentially, textures are graphic effects that make the illusion of a certain real-life object or surface. As an example, we see plenty of folded paper and wood textures in many different designs. Concrete, leather or stone ones are also widely used. Textures often are made up of repeated images but they seem like they are natural and random. The effective use of textures is not tied to creating wallpapers, their qualities can be employed in any interface component. With the addition of texture vectors, we can easily make an impression of some natural traits, form depth, and add accents. 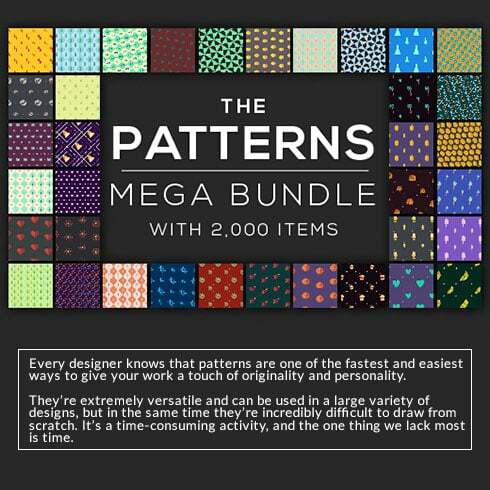 What exactly a The Best Patterns Mega Bundle is? The pattern can be described as visual composition you can observe almost everywhere and each and every day. In fact your own house is full of patterns, for instance, on the wallpaper that decorate the walls of the home’s living room. The pattern is a component of the image that is repeated on and on to make a large, symmetrical and geometrical image. Both the textures and patterns are widely used in designs. Web designers like to utilize them due to the fact patterns and textures are a great backdrop for a web page – they do not sidetrack the visitor but underline the essence of the webpage. It is extremely expensive to buy them as a stand alone, for that reason typically textures and patterns are bought in bundles. A set is a group of graphics or other design elements that are sold as a group. The very best aspect of these item package deals is their price tag. A package will amount to a lot cheaper than each product if bought individually. Often, a kit will include what you need to complete a design task. These special deals are limited in time, so don’t miss the chance to get useful design resources and get a better price. The reasons why the The Best Patterns Mega Bundle quality is vital? If you need to get a cool and engaging design that will make an impression on the viewer – never try to save on materials and tools. Superior quality textures or patterns could make almost any design rock, so stay clear of unprofessional products. Inadequate color choice or low-res illustrations or photos might wreck the look of the project. Let’s say I failed to find the product I need in the package? It might happen not every package deal includes things you need which is really common. Deals are packaged for diverse requirements and for a different design and style. However, MasterBundles website provides dozens of deals for almost every occasion, so if a given bundle doesn’t provide all the products and solutions you want – you can check the other bundles. There are plenty of of these, that it is almost sure you’ll discover something appropriate. Does MasterBundles promote any additional alternative packages? MasterBundles site carries a wide range of textures & patterns bundles, both natural and man-made. Their cost ranges from $4 to $19 and those are high-quality, items created by professionals. However, textures and patterns aren’t the only products MasterBundles.com could supply you with. There are ebooks, font bundles, photos, icons, logos, illustrations and mockups, and a bunch of other stuff. You can in fact find website themes on MasterBundles for a more affordable price! MasterBundles.com is an internet marketplace. On our website, pro designers offer their masterpieces at the best prices. This site offers the best deals on the market, and our products are well praised by buyers. Take a look at our blog, it is packed with valuable information for pro designers. Additionally, if you subscribe to our newsletter, you will be the first to know about our special discounts. You will always find discount coupons and promo codes available to reduce the prices to a bare minimum.